Look, Cover, Check, Write is a strategy your child will be taught in schools to help them learn spellings. Find out how the strategy is taught in the classroom so you can reinforce learning at home in the same way. 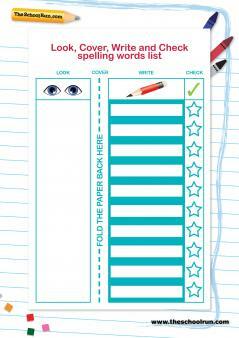 Look, Cover, Write, Check is a strategy used to help children learn their spellings. uncovers the spelling to check if they have got it right. This is a good method to teach children so that they practise learning the spellings of words, but also so that they are testing themselves. Children are usually given weekly spelling lists throughout their time at primary school and this strategy is often suggested by teachers for children to use at home. Teachers sometimes give children Look, Cover, Write, Check grids so that they can test themselves a few times. For example, if a child was learning spellings ending -tion, these might be put in a column on the left and then a few more blank columns provided so that children could practise writing the spelling a few times to learn it. Teachers may also write out spellings children have got wrong in their writing and encourage children to use this strategy to learn these spellings as well. For more ideas to help children prepare for the weekly spelling test try 5 unusual ways to help with spelling, 9 spelling tips from real parents, great spelling games, teachers' tricks for spelling and lots more articles about primary-school spelling.